5 Essential Potty Training Tips (And why NOW is the perfect time to start). So, Aria is now over 2 1/2 and has been potty trained for quite some time. I hear girls are easier to train than boys, but while most of her little girlfriends are still running around in pull-ups, she has been diaper free for over 6 months. Here are the things that I found got her using the toilet in no-time. 1) Get that Potty: As soon as Aria showed interest (following me into the bathroom and looking up with curious eyes) we bought her her own potty. She was just over a year old, and while for months and months she just sat on it (even with her clothes on) and did nothing, the seed was still planted. So, find a fun potty that they love and make it another special thing for your little one. 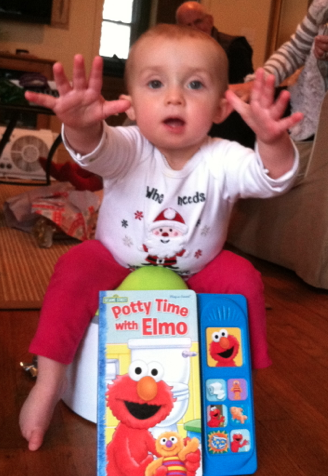 2) Talk it up: Talk, read, show & tell, heck, even sing about using the potty if you have to! We used all the methods. Explaining why we use the potty, reading about how Elmo goes to the potty, and even watching the Daniel Tiger Episode about using the potty (over and over), and of course singing Daniel Tiger’s song “if you have to go potty STOP and go right away!…” (Aria still sings it to us) all helped tremendously. 3) Put them on & Be Patient: Most toddlers don’t know when they have to go to the bathroom (at least not initially). Remind them that they have to use the potty– and moreover put them on it regularly. Patience is going to be a big virtue during this time because you’re going to have to wait over and over again. 4) Celebrate big: When your little one has a go at it and makes it to the potty, celebrate big! We had a lot of clapping and celebratory “pee pee dances.” Some parents do sticker books or reward charts to track progress. 5) GO Diaperless: This is the big one!! Yes, even before your child is trained, pulling them out of the pull-ups is a great way to help them get prompted to use the potty. Let them pee on themselves (and unfortunately possibly your floor or chair or any innocent bystander) because only then will they really realize what not using the potty results in. SUMMER IS THE PERFECT TIME because at least there is a much higher chance of that “accident” being outside. Aria had two pees on the deck and one on the floor and quickly started telling me when she had to use the potty. She did not like being covered in pee (that’s my girl!) Diapers only prolong the process. Stay tuned, next post is about the one potty ALL moms should buy. It will make your potty training life SO much easier.